The Var'Lande used to be a very nice elven thorp. However, it would seem as though some goblins have come marauding through there. The citizens have been slain. Some of the children have even been carted off. That would be horrible enough, warranting some adventurers to go avenge the slain and release the children. However, to add to it all, the goblins are looking to raise an ancient evil during the Garnet Gales Aurora. That you'll definitely want to stop. 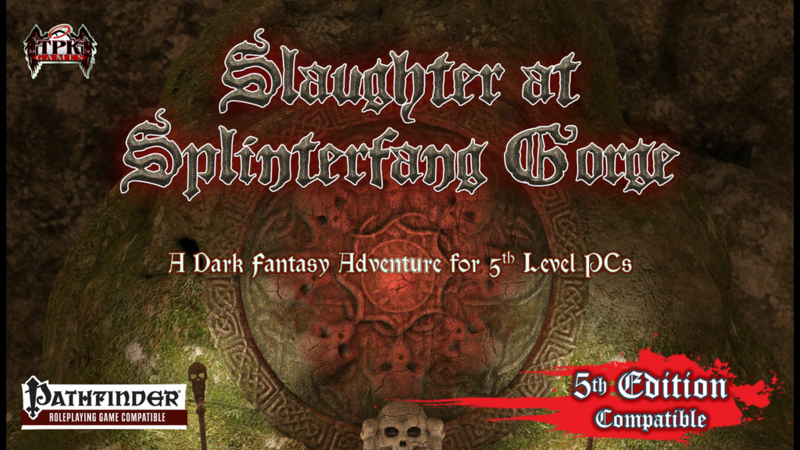 That's the story behind Slaughter at Splinterfang Gorge, a new adventure up on Kickstarter for Pathfinder and 5th Ed. The campaign is looking to fund a couple of 64-page adventures for both the Pathfinder and 5th Edition Dungeons and Dragons systems. They've got everything you need, with maps, set-up, ambiance, monsters, npcs. The works. All you gotta do is get your gamers together and start playing. The Kickstarter campaign's about 70% funded with still 29 days to go.